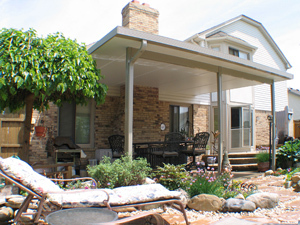 Patio covers are an ideal upgrade for homes in Pensacola, Florida, and surrounding areas. These outdoor living structures offer shade for patio furniture, pool decks, BBQ areas, and other outdoor recreation spots, allowing you to seek comfort from the sun or rainy weather whenever necessary. Majors Home Improvement is a local, family-owned business that has been providing area homeowners with quality home improvement products and installation services since 1997. We hold an A+ rating with the Better Business Bureau, which means that when you turn to us for patio covers, you can trust that you’ll receive exceptional customer service, professional installations, and products that stand the test of time. You’ll also be able to customize our patio covers with gorgeous, Italian-inspired columns, available in three styles, Florentine, Roma, and Venetian, as well as with a beautiful finish color, choosing from white or sandstone. When you hire Majors to install a patio cover at your home, you’ll receive a professional installation from our team of technicians. They are factory-trained, highly experienced, and adhere to strict customer service guidelines, such as silencing cell phones during installation and cleaning up the worksite at the project’s completion. If you’d like to learn more about our patio covers for homeowners in Pensacola, FL, and surrounding communities, contact Majors Home Improvement today. When you do, feel free to inquire about our financing opportunities for qualified homeowners.